A few days late, but close enough! It is hard to keep up with these because I swear its time to do the next month’s as soon as I do this month’s! So here’s the rundown on what our little girl is doing now…. Weight: Using the super-accurate weigh at home method ((And yes, I made DB do it since I’m not supposed to get on the scale until my 30 days are up.)) LB clocks in at 23.8 lbs! She’s got some heft to her, to say the least. Diapers/Clothes: LB’s still wearing Size 4 Pampers (they say they go up to 28 lbs, so we should be in ’em for awhile). Clothes-wise, she’s mainly in 18 month things. Although I am having a heck of a time finding pants for her! The 18 month ones fit her thighs (barely) but they’re like 3 inches too long!!!! I may have to buy a sewing machine just so I can buy her pants that fit in the seat and hem them – maybe the 24 month size would fit?! Anyone know where to get extra-stretchy baby pants? Standing/Walking: The Littlest Brewster is not walking solo yet, but we keep thinking it is going to happen any day. She’ll stand on her own for extended periods (read: 45 seconds) and has taken one or two tentative steps, but she sits down as soon as she realizes she’s doing on her own. She’s also a champion stair climber (only under supervision) and enjoys going upstairs for her bath every night. New Foods: We have added bacon, blueberries, egg whites, green beans, Lima beans, pancakes, and spinach. We’re doing our best to raise a non-picky eater and I think we’ve done a damn good job so far. Teeth: LB is up to 6 teeth now! (Well, 5 1/2 really… But it’s mostly through so we count it anyway!) Shes got 4 up top and 2 down low. We brush her teeth every night before bed and she thinks its the most fun thing ever. And now the real reason anyone reads these updates: the monthly photo! 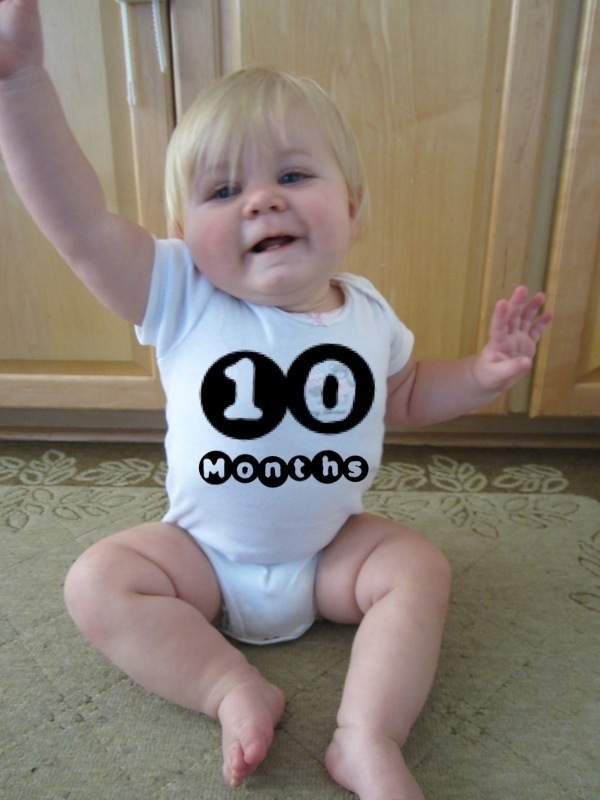 This entry was posted in Babies and tagged Monthly Updates by BrewsterMama. Bookmark the permalink.